You’re invited to Emerald Gardens for a Battle of the Bowls Chili Cook Off! Help Us Crown a Champion! 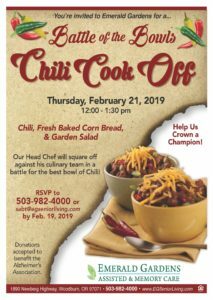 Our Head Chef will square off against his culinary team in a battle for the best bowl of Chili!